In my own case some of the images in my recent book (and current exhibition) “Wales at Waters Edge” “were the result of plonking myself in a location then just walking and looking. Quite often the makings of a photograph seemed to reach my consciousness from peripheral vision (or elsewhere) as my mind wandered. “ (to quote from the Afterword). As far as subject matter is concerned the relationship between the human and natural realms requires that both should be present. Personally I particularly enjoy exploring the interface between the two; those areas that Richard Mabey called the “Unofficial Countryside”, and the authors Paul Farley and Michael Symmons Roberts describe as the “Edgelands”. After such visits I would not expect to return; the fun involved in this type of photography is its spontenaiety. Sometimes the subject matter will be ephemeral, anyway, like graffiti carved into sand which will be washed away by the next high tide. This is not to say that on a visit to an iconic “wilderness” viewpoint one should not also be aware of unexpected details that one might pass on the way. Another image made on that journey could be a interesting counterpoint to the “heroic landscape” that might already be in the can. Or it might be completely unrelated. On the walk back from one wild place I once came across a racing pigeon carcass with its owner's phone number stamped on its feathers. I would suggest, however, that the quality of light often necessary for the big landscape might not be ideal for the detail. Cloudy conditions will tend to be more appropriate – I call it “honest light” - for the more documentary style image that the psychogeographer would hope to find in the landscape. The celebrated 20th century photographer Alfred Stieglitz produced a series of images which he called “equivalents”; each one, he claimed, corresponded to his state of mind at the time it was taken. Ansel Adams developed this concept in his own work, explaining it as follows “When I see something I react to it and I state it, and that's the equivalent of what I felt”. These sentiments are sometimes expressed by today's landcsape photographers: on a (very) good day s/he will have been present for a fleeting moment when all the elements of land and light come together. The reaction of most photographers would, I imagine, then swiftly incline towards panic : Wow! This is amazing............how can I get this right? The best one can hope for even after many years of experience is the calm, collected and efficient operation of one's equipment such that the image can be made. Any emotions present in such a situation are a positive disadvantage. In a way it is one of the sacrifices a photographer makes. 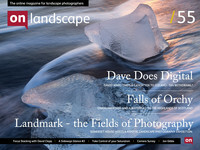 A closely related issue, I feel, is the very limited range of emotions that can be expressed in a landscape photograph. The author can pour out his/her feelings in prose or poetry, the composer in their music, and so on, and we all recognise them. When out in the landscape the photographer may occasionally come across something that makes the blood boil; a completely inappropriate development in stunning surroundings, for example. I would suggest that it is completely acceptable to channel that anger into image-making. If viewers recoil at the sight of the images, then the photographer will have done their job. And it is sometimes possible, especially for the psychogeographer, to make a landscape image with a humourous element. But how would the landscape photographer express their grief at the loss of a loved one, or the fear s/he might experience at the onset of a terminal illness? I suggest that it would be impossible – even for Alfred Stieglitz. As wonderful as the heroic landscape can be, then, it will usually portray its subject matter in a rosy -tinted light. Taking the “sideways glance” at the landscape that I have been suggesting here, can add depth and diversity to one's portrayal of it. One photographer I spoke to (not a landscape specialist, incidentally) commented, “I think that's what happens after you move beyond sunsets and pictures of kittens.” This rather harsh turn of phrase does however express the sentiment that more personal statements about one's surroundings are possible. It is a way of finding one's own voice.